Add a touch of civility to teatime with these bookish tea bags tagged with wry quotes from literary greats. The idea of "tea time" is a luxurious concept, but it needn't take an hour or be accompanied by a fox hunt. 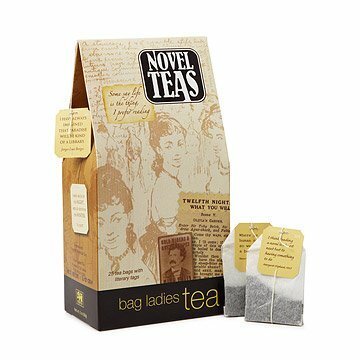 Treat yourself to a daily dose of antiquity with this literary set of 25 teabags. Each English Breakfast teabag is individually tagged with beloved quotes from your favorite authors. You may not have time for cucumber sandwiches, but you can certainly bring CS Lewis into the boardroom. Tea is grown and packed in Sri Lanka. The recipients of Novelteas were pleased and even promised an occasion to share a cup of tea. Perfect for your avid reader friends! Yummy tea with a fun theme! Great stocking stuffer! We gave this as a gift but it was a unique and adorable gift to give. Anyone who likes literature and/or tea would love this I'm sure! Great gift for tea and book lover. Be aware that it's a tiny amount for what you're paying for. Great way to gift tea with a little whimsy and thoughtfulness. This makes for a quick, easy and cute gift for the reader in the family that you have no idea what to buy for. Howe've, the bag is smaller than it looks like it is going to be so it's less impressive than I hoped for. Since I gave it as a gift, I can't attest to the actual tea taste. I bought this for my friend and she loves this. It paired perfectly with the mug of banned books.